Thought for the day: The average human life spans fewer than 1,000 months. My last week in Botswana is a blur of Gaborone North, Fashion Lounge, Linga Longa, Lizard Lounge, brunches with Malebogo, meeting friends and others, the President, sleeping on the future president’s couch, Tingle, and planning Mozambique. I even get to try a couple of new venues – O’Hagan Pub and Dros. That’s it now, I really have exhausted all watering holes except the local liquor stores and Chibuku joints. 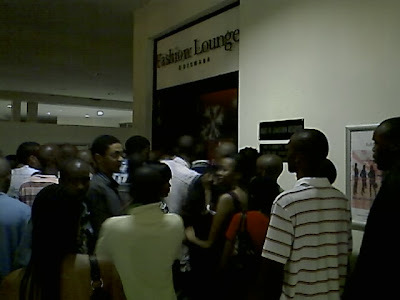 Fashion Lounge occupies part of a shopping mall which I suspect no one ever goes to, except for Fashion Lounge. The car park is empty all day, then suddenly about 11pm it’s heaving! Of course, Thabiso doesn’t believe in paying entry fees for anything like this, so we go round the back and wait the usual half an hour whilst he argues with bouncers and the owner. He does succeed though, avoiding us the 50 or 60 pula entry fee, not to be scoffed at for the seven of us or so. Interestingly, I know some of the bouncers now – these were the guys at Palapye who I was hanging out with! Someone buy this girl some flowers! It’s quite a night, ending with Thabiso and Herbert rolling about in the mud in the car park (long story). I walk back to Gabs North with Herbert. In the morning a girl I don’t know, a friend of Madoda’s, comes into our room. Picture the scene: Herbs and I in bed, neither wearing much. She starts asking a question about where something is, as her eyes take in the scene, jumping to certain conclusions. Her question peters out, and she smiles and leaves the interracial lovers to their bedroom antics!! Later in the week, Thabiso calls a dinner for Malebogo to celebrate their engagement. It’s a small do, just a dozen people, on Saturday evening. Now, guess when Thabiso arranges this! About three hours beforehand. He calls all of the invitees, and every single one comes along! Can you imagine that in London? The thing I hate about my friends is that if you want to get more than three of them out together, you have to give them three months notice. And then it’s so far ahead that half of them don’t want to commit because “a better offer” might come along. Gits. Anyway, this is not how it works in Botswana, no one plans anything until just before it happens, so everyone’s diary is generally free. The dinner is a surprise for Malebogo, so we’re all waiting in the dark when she walks in. She wasn’t expecting it, that was obvious from her expression! I had been feeding her false texts in the afternoon to allay any suspicions – about meeting up after dinner for drinks etc). It’s a nice dinner, though Herbert is perhaps a little too vocal. What else would one expect from him though, especially as Thabiso getting married to Malebogo is effectively a divorce for him! The venue is strange – the Maharajah restaurant. It’s possibly the most characterless Indian restaurant I’ve ever been to in my entire life, I feel like we’re in a business conference centre, and at any moment someone will pull a whiteboard or flipchart out and ask us to brainstorm. Food is not bad though. Mimi likes the mini wings. The popadoms are the oiliest I’ve ever eaten though, it’s almost like they dosed them in extra oil after cooking them. Yucks.